Note: This post is part 6 of 7. Click here for Part 1 2 3 4 5 7. On May 5, I spent the day at a local high school. The Math Department Head asked me to come to her school and model learning through problem solving in various classes throughout the day. In the end, I did 6 LTPS examples in 4 periods. It was a lot of fun for me to be back in front of kids, and I enjoyed having the opportunity to try out some of the things I’ve been playing around with. The request to visit the school, and the subsequent planning I did was the inspiration for this series on my blog. Here is what I did, and how it went. It wasn’t perfect. This post will describe my morning. The next one will describe my afternoon. These will end up being long enough posts without me explaining the lessons in detail. I will eventually put full lesson packages for all of these on this blog. Class #1 – Math 24 For those readers not from Alberta, Math 24 is a non-academic math class for 11th graders. It is the minimum requirement for graduation. Topics include ratios, consumer math (mortgages, loans, budgeting), earning an income, tax, scale diagrams, and statistics. It is the last year for this course, since our new curriculum reaches grade 11 next year. This course will be replaced by Math 20-3. For more information on our revised curriculum, click here. LTPS – Which liquid is most expensive? I started the day with a problem I’ve used before. 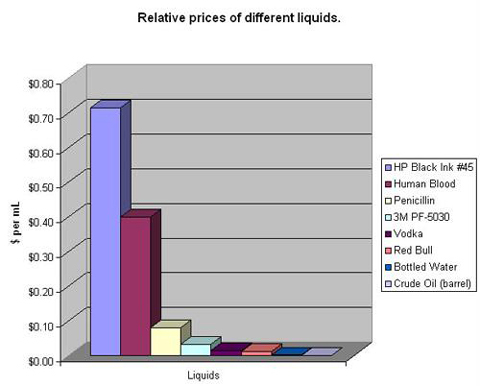 This picture is all over the internet if you google “Price of HP Ink 45”. Since I couldn’t find prices for the 3M PF-5030, I modified it slightly. I started by giving pairs of students the first page of this handout (printed in colour). I asked them to cut out the pictures. Then I asked them what they wondered about. They wondered what some of the pictures were. They wondered if they were all liquids, and then they wondered how much liquid was in each. Very shortly, they began to wonder which cost more. That’s where I was hoping they would go. I asked them to sort them in order from least expensive to most expensive. Then I got them to get up and take a look at how all the other groups had ranked the liquids. Most had the water being the cheapest, and the oil being the most expensive, but there were variations. Then I asked them how we could tell for sure which was the most expensive. They told me they’d need to know how much each one cost, and how much liquid was in each one. I gave them the following information. As I was giving them the price of oil, it was in the process of dropping 10% in one day, but I digress. They got right to work on the math. The classroom teacher and I circulated and helped keep them going in the right direction. In the end, almost all were able to re-rank the liquids correctly. Many were surprised at the results. What went well: The students were great. They were engaged, enthusiastic, and had fun with it. This was a great class. What I could have done better: I may have helped some of them too much when they got to the calculation part. They were struggling with the unit rate. I probably should have let them struggle a little longer. Curricular Fit: 100%. Unit rates are in Math 24. It could also be used in Math 10-3. Class #2 – Math 10-3 Math 10-3 is a class for non-academic 10th grade students. It is intended for students who failed Math 9, or students who know they want to pursue a trade. It is designed as a trades and workplace math course. Topics covered include measurement, geometry, ratios and earning an income. I borrowed Dan Meyer’s water tank problem for this class. I began with the video. It didn’t go long before they were complaining about being bored, and starting to be disengaged. I stopped the video and asked them what they wondered about. The wondered what it was. 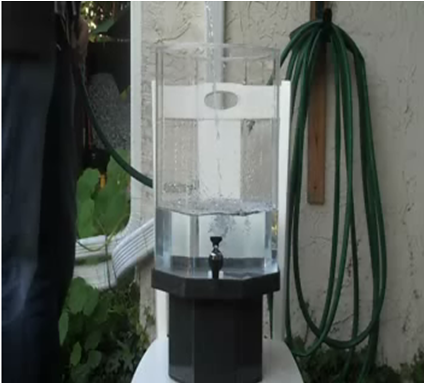 They wondered why some guy was filling it up and recording it. They wondered how much water it would hold. It didn’t take long for them to wonder how long it would take to fill up. I asked them for guesses. The range was between 5 minutes and 30 minutes. Then I asked them what they would need to figure out the answer. They asked for what shape it was, how tall it was, how long one side was, what the area of the base was (which I gave them, because that’s a real tough calculation in Math 10-3, with no trig covered yet) and how fast the water was going into it. They got to work. I’ve been out of the classroom way too long, because one fellow figured it out and he was so excited I almost hugged him. That would have been weird and creepy, so I restrained myself. Many groups needed help, and I helped as little as I could. In the end, we had answers ranging from 7 minutes to 9 minutes (8.23 minutes being the correct answer based on the measurements I gave them). One girl was insistent that the answer was 8 minutes and 23 seconds, which led to a good conversation after we watched the answer video. We sped the video ahead to 7 minutes, and a class of non-academic 10th graders watched intently. They were disappointed that they were wrong until we managed to figure out that 8.23 minutes was actually right, and equivalent to 8:13. What went well: Kids who were initially disengaged got invested in it once they had a guess registered. The teacher told me that it was nice to see his class so engaged. What I could have done better: The were so engaged, I should have had them attach their names to guesses on the board. Surprising: I had a little more time left, so I showed them the Bucky video (see Math 10-4 lesson). Then I left. One girl was so into it, she came and found me in the classroom I went to next to show me her answer to the Bucky problem. This is a non-academic kid, remember, going out of her way to solve a problem, and proud enough of it to come and find me and share it. Hook, line, and sinker. Curricular Fit: 100% – Volume of solids is in Math 10-3. Could also be used in Math 10C. Class #3 – Math 10C Math 10C is our combined grade 10 math course. It is the entry to pre-calculus 11 and 12 or foundations 11 and 12. Students who pass math 9 take this course. It is our most academic grade 10 level math course. I used the Giant Gummy Bear problem, exactly as described in an earlier post. After watching the question video (in which I edited out the number of small gummy bears and the dimensions of the giant one), I asked the students what they wondered about. They wondered how long it would take to eat the giant gummy bear. They wondered how many small gummy bears were equivalent to the giant gummy bear. They wondered how tall the giant gummy bear was. 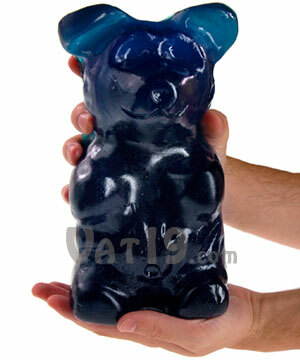 They wondered if it was real, and if they could really get giant gummy bears. I asked them where they wanted to go with it, and they decided to figure out how tall the giant gummy bear is. I explained that the number of small gummy bears equivalent to the giant one was a necessary step along the way, so we elicited guesses for both the number of small gummy bears, and the height of the giant one. I asked them what they needed to know to figure out the answers. They said they needed to know the size of a small one. They were excited when I pulled out bags of gummy bears for each group from my lunch kit. They were convinced I had a giant one in there (I didn’t). I gave them the gummy bears, and they got to work. All groups got very reasonable answers for the number of small gummy bears equivalent to the giant one (I think the range was from 900 to 1600). Many used the calories, and some used the mass. Interestingly, those that used the calories were closest to the answer Vat19 alleges is correct. It fell apart a bit at the point where they had to figure out the height of the giant one. Going from a 1 to 1400 ratio from calories proved to be a difficult thing to scale up to the giant one. They weren’t considering the volume (3 dimensional) of the bears, and were getting unreasonable answers. Fortunately, they knew their answers were unreasonable. Unfortunately, they didn’t know how to fix them. I played the answer video. Most were satisfied with their answers to the number of small gummy bears, but very few had anything reasonable (other than their guess) for the height of the giant one. We debriefed the problem. We talked about why their answers were so varied for the number of gummy bears. They discovered that some had used the calories, some had worked with mass. They discovered that there was a variation of between 24 and 30 gummy bears in the bags I handed out. No one thought to question the claim made by Vat19 in the video. Are our kids too trusting of advertising? This error analysis discussion was rich. What went well: The video and process really had the class engaged. What I could have done better: When they struggled with figuring out the height of the giant one, I didn’t help them properly. They would have gotten there if I had reminded them of their three-dimensional geometry from an earlier unit of study. Instead, most left this part frustrated. Curricular Fit: 70% – Proportional reasoning is not in Math 10C (It’s in our Math 20-2). The measurement component of this exercise fits Math 10C. The entire thing could be used with 100% fit in Math 20-2. After this class it was lunch time. I’ll describe the afternoon in the next post.